The core of the acclaimed film Mad to be Normal, the radical psychiatrist R. D. Laing took the world by storm in the 1960s and 1970s with his ideas about madness, families and people’s need for authenticity. At the height of his fame he could fill stadiums like Bob Dylan, and often did so. He became an icon of the movement that held psychiatry to be an agency of repression, his phrases on a million hippy T-shirts. Then he fell from grace, flung out of the medical profession, and his influence has been waning since. His basic ideas have been regarded as having been discredited. Yet, despite this, his influence is also everywhere – but largely unnoticed and unremarked. This book tells the extraordinary human story of his struggle, first with the authorities as a psychiatrist in the army and then a series of mental hospitals. It explains his extraordinary influence in the context of the upheavals of those psychedelic days – and it looks at what we can still learn from Laing today. Boyle finds he still has an unexpectedly potent message. There was a time when people suffering from mental health illnesses were forcibly locked away and given little thought. They were subjected to electric shock treatments, drugged up until they no longer really functioned and much worse. They weren’t consulted about treatments or listened to. That was until Ronald Laing with his controversial theories and therapies spoke out in the 1950’s and 1960’s. Ronald Laing had a very traumatic childhood with parents that were far from normal but if that is all you have known you accept it without question. It is only with talking to others that you would know your childhood wasn’t like theirs. 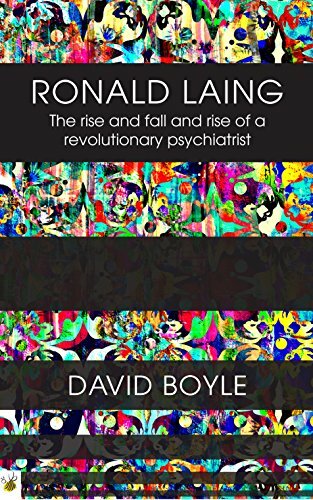 The world of psychiatrists became divided as to whether Laing was a revolutionary genius or a mad man. Laing had a fascination with brain function and stripped everything back to basics. Minimised drugs and literally flung open doors of mental institutions but more than anything he talked to people and listened to them. Laing definitely had his own demons though with his strange childhood, alcohol addition and frequent LSD usage. He went from super star status to discredited. David Boyle’s novel is a well balanced look at the difference one man can have on society as although not all of Laing’s methods were taken on board things did change and move some what away from the medieval ways of lock them up and throw away the key method even if Laing isn’t credited for it. David Boyle is the author of Blondel’s Song: The capture, imprisonment and ransom of Richard the Lionheart, and a series of books about history, social change and the future. His book Authenticity: Brands, Fakes, Spin and the Lust for Real Life helped put the search for authenticity on the agenda as a social phenomenon. The Tyranny of Numbers and The Sum of Our Discontent predicted the backlash against the government’s target culture. Funny Money launched the time banks movement in the UK. David is an associate of the new economics foundation, the pioneering think-tank in London, and has been at the heart of the effort to introduce time banks to Britain as a critical element of public service reform – since when the movement has grown to more than 100 projects in the UK. He is also the founder of the London Time Bank network and co-founder of Time Banks UK. He writes about the future of volunteering, cities and business. His work on the future of money has also been covered in books and pamphlets like Why London Needs its own Currency (nef, 2000), Virtual Currencies (Financial Times, 2000), The Money Changers: Currency reform from Aristotle to e-cash (Earthscan, 2002) and The Little Money Book (Alastair Sawday, 2003). He has written for many national newspapers and magazines, and edited a range of magazines including Town & Country Planning and Liberal Democrat News. He is the editor of Radical Economics. He lives in Crystal Palace, in south London, with Sarah and Robin (two years old). He is a member of the Federal Policy Committee of the Liberal Democrats and he stood for Parliament in Regents Park and Kensington North in 2001. THRILL ME. CHILL ME. READS. I'll be outside of the mosh pit . . . waiting with bandaids and kleenex . . . When the green woods laugh with the voice of joy, And the dimpling stream runs laughing by; When the air does laugh with our merry wit, And the green hill laughs with the noise of it. My atempts at writing a book - how hard can it be? Whittling Words and Weaving Worlds. Poet and Epic Fantasy Author. Reading takes me to other worlds. Other times and other places. Books, book reviews and bookish news. Research is my passion books give me the drive to continue it. Happiness... that's what books smells like. Happiness. That's why I always wanted to have a book shop. What better life than to trade in happiness?